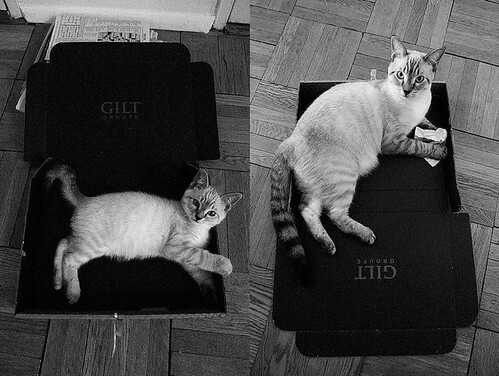 in other news of tiny creatures and families, i give you steve in february and steve this morning; same box (we hoard). i am going to bawl like a baby when he graduates from military school. You're slaying me today, Auntie El. steve loves hims GILT BOX. there has never been a better side by side. never will. he is a FINE young man. But the eyes change more than anything. Your cats look like mine! Mine are lynxpoint Siamese, ie, a cross between a tabby (which means they shed all the time) and a Siamese (loud). I had hoped for the Siamese characteristic of no shedding and the tabby quality of tiny, infrequent meows, but it didn't work out that way. @cf, the shedding thing really is insane - i think he projectile-sheds. we did get the infrequent meows, though - i'm trying to coax him out of that, as i love talkers. Ooops! I mean "you cat," singular. I didn't look closely enough. He is a cutie. I'm not sure you want to encourage too much talking. Laverne never shuts up. She provides her own soundtrack.